The best thing about Galveston this time of year is the utter lack of competition for the things I find essential. Video store shelves bulge with first-run movies, The Blair Witch Project and Wild Wild West in ample supply. Grocery store parking lots at peak shopping times are rarely more than half full. The genial bookseller at Midsummer Books has plenty of good works on hand and the leisure to chat about them. Left turns are easy, even at so-called rush hour, even across northbound Broadway traffic; so easy in fact, that I delight in making them unnecessarily. 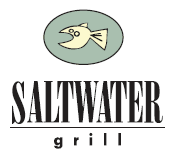 So you can imagine my pique at being turned away from Galveston's newest restaurant, the Saltwater Grill, not once or twice but three times running. "I'm so sorry," said the hostess on my first attempt. "We're absolutely booked solid for dinner tonight. Would you like a copy of our menu to take with you?" Snarling, I stalked off. I had plenty of time later to examine that menu while warming frozen corn dogs in my toaster oven. Littleneck clams from the Florida Keys were on offer at the Saltwater Grill that night; along with Malpeque oysters from Canada and blue mussels from "Icey Bay," wherever that is. Curses! Two weeks later I tried again, but I could see from the street that the room was packed to the gills. The tantalizing scents of red pepper and sautéed garlic and briny fresh seafood maddened me. The third time I stopped by, the host just grinned and shook his head. Of course I had mulishly refused to make reservations. They ruin the illusion of spontaneity I cherish, especially in Galveston, particularly in winter. So, for my final assault, I craftily picked an arrival time -- 8 p.m. -- synchronized to the curtain going up at the Grand 1894 Opera House across the street. That lucky night, just as all those slightly tipsy Jerry Jeff Walker fans abandoned their tables, my brave party sailed right in. I was thrilled to find seats at the bar, even though there were plenty of tables. I wanted to get a good, close look at the Saltwater Grill's kettle system. I've not seen this culinary device anywhere else. Three shiny stainless steel buckets with curved bottoms are linked to steam pipes that angle down into a water heater below the counter. The gentleman who introduced himself as "Big Lew" Johnson operates the kettles, twirling a faucet to control the flow of scalding steam into the sealed containers. "I can bring water to a rolling boil in three minutes with this," he explained proudly. "Nobody else has one of these gizmos yet, but you watch, by next year, everybody and their dog will get one." Seafood that has spent only minutes over the heat is incomparably better than seafood that has spent hours drowning at the back of a traditional stove. One pull of the kettle handle and your bowl is filled with piping hot gumbo. "Man, when was the last time you were served restaurant food that's really hot?" marveled a friend. But be forewarned: The "Little Daddy" gumbo serving at $6.95 equals a standard-size restaurant bowl; ask for the "Big Daddy" ($12.95) and you'd better have a real good excuse for not finishing it under Big Lew's daunting gaze. Entranced by the machinery, we asked Johnson to steam us some mussels ($10.95) in a garlicky white wine broth, "the best on the island," he informed us. They were. We were equally stunned by his rendition of shrimp scampi ($13.95), made with cream of course, but noticeably lightened with the same seductive broth. "That's what I've been doing wrong, cooking this at home," muttered one of my companions. "It doesn't have to be killer rich, does it?" He stared into the bowl as if memorizing the contents. I don't mean to imply that the kettle is better than the kitchen at the Saltwater Grill, though I am convinced it's the centerpiece. We were well pleased with everything we ate that night, right down to the desserts. For starters, we loved the strange treatment of the asparagus ($8.95): The spears are breaded, fried and then topped with crabmeat. Can you imagine a breaded, fried vegetable that could outshine even delectably fresh lump crab? This is it. The coating around the asparagus is loose and a little crumbly, crisply browned and a touch salty. The result was irresistible. We also liked the pair of fat blue crab cakes ($7.95), breaded and dusted with corn meal, served atop a warm relish of roasted corn and tomatoes. The plate was drizzled with a creamy sauce studded with pungent dark grains of mustard; I only wish there'd been a bit more of it to dunk bites. Even plain-Jane tomato soup ($4.95) gets a flavor face-lift here, textured with coarsely chopped roasted tomatoes and spiked with toasted cumin and coriander. Of the big-deal main dishes, we were delighted with that night's "Red, White & Grilled Tuna" ($17.95), a nod to the Joe Sears and Jaston Williams's show Red, White and Tuna last summer at the Opera House across the street. This dish features a large, thick filet of Hawaiian ahi tuna, perfectly grilled to a cool mauve center, resting on a bed of buckwheat soba noodles tossed with tasty slivers of sautéed bok choy and snow peas. A vivid red Thai sauce, slightly sweet and piquant with chile peppers, is drizzled all over. There are only four desserts at the Saltwater Grill, and we were so sated we could muster energy for only two. The best, at least from our limited sample, is the chocolate truffle cake with raspberry coulis ($5.95). It's worth the 15-minute prep time wait, believe me. Out comes a small, dark chocolate cake shaped like a fat muffin, powdered with sugar and drizzled with sweet-tart pureed raspberries. When you put a fork to it, the cake splits open to release a lava flow of hot melted chocolate. Try not to lick the plate; ask for a spoon instead to scoop up every last bit. We also liked the cheesecake made with white chocolate ($5.50), laced with the same raspberry coulis and stuffed with cranberries and pecans. So what if the tart cranberries and raspberries somewhat obscured the flavor of white chocolate. It could have been any sort of rich, creamy cheesecake. The precisely judged combination of sweet and sour was so charming, we simply didn't care. That night we lingered late at the bar, admiring its blue glaze, the frosted glass lamps shaped like stylized fish, and most of all Big Lew's performance art at the kettles. I kept thinking, Pinch me, I'm in Galveston? This restaurant could hold its own anywhere. But you know, if this restaurant were in Houston, you'd never be able to get a table.